Background: The molecular events that accompany the progression to adenocarcinoma (ADC) of the esophagus are poorly understood. Aberrant mucin receptor expression can contribute to increased cell growth and metastatic ability. Aim: The aim of this study was to establish a pattern for mucin (MUC) gene expression in the esophageal mucosa under normal and pathological conditions. Setting: University Hospital Cancer Center Laboratory. Archived tissue samples studied in a retrospective fashion. Materials And Methods: Tissue samples were obtained from the archives of patients with histological evidence of Barrett's esophagus (BE) progressing to ADC. Immunohistochemical analysis was performed using mouse monoclonal antibodies for MUC1, MUC2, MUC5AC, MUC6. Semiquantitative scoring of histological staining was performed using a linear scoring system: 0-staining absent; 1-staining in 0-25%; 2-staining in 25-50%; and 3-staining in 50-75% of the epithelium. The Binomial test was used to explore trends and differences in frequency of mucin expression along the pathological sequence. 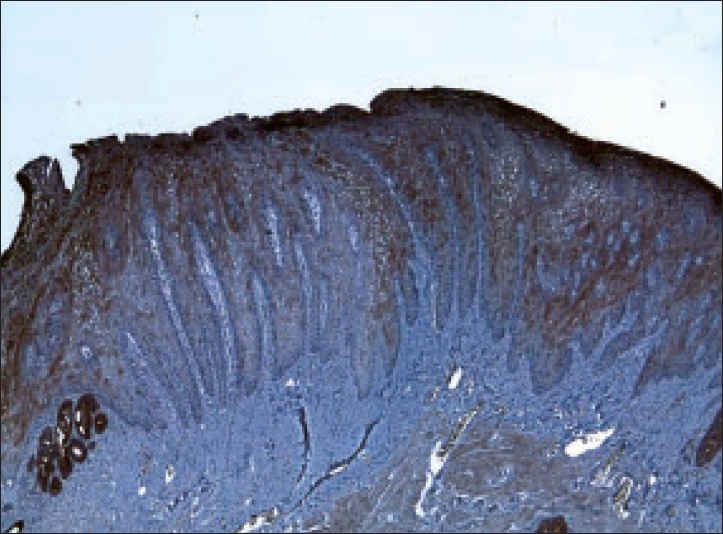 Results: Only mild superficial staining of MUC1 was seen in normal squamous epithelium. MUC1 and MUC2 were uniformly expressed in all samples (7/7) of BE and dysplasia ( P =0.008). MUC1 expression was upregulated (7/7) in progression to adenocarcinoma ( P =0.008). The secretory mucins, MUC5AC and MUC6 showed a decrease in expression with progression from BE to dysplasia to ADC ( P <0.05). Conclusions: Downregulation of MUC5AC and MUC6 decreases mucosal protection against gastric acid. Increasing MUC1 expression is associated with progression from dysplasia to ADC. Upregulation of MUC2 reflects intestinal metaplasia in BE. Background: The prognostic factors in nonseminomatous germ cell tumors have been mainly derived from the analysis of stage I tumors. Aims: The aim of this study was to evaluate some prognostic factors and the outcome of patients with stage II and III nonseminomatous germ cell tumors according to risk groups treated between 1993 and 2002. Settings and Design: Patients were retrospectively classified as good, intermediate and poor risk groups according to International Germ Cell Cancer Consensus Group. Materials and Methods: Biopsy specimens of 58 patients with stage II and III nonseminomatous germ cell tumors were analyzed by means of tumor histopathology, primary localization site of the tumor, relapse sites, initial serum tumor marker levels, the presence of persistent serum tumor marker elevation and the patients' outcome. Statistical Analysis :0 Kruskall Wallis test and Mann-Whitney U test were used to determine the differences between the groups. Kaplan-Meier method was used for survival analysis and log rank test was used to compare the survival probabilities of groups. Cox proportional hazard analysis was used to determine the prognostic factors in univariate and multivariate analysis. 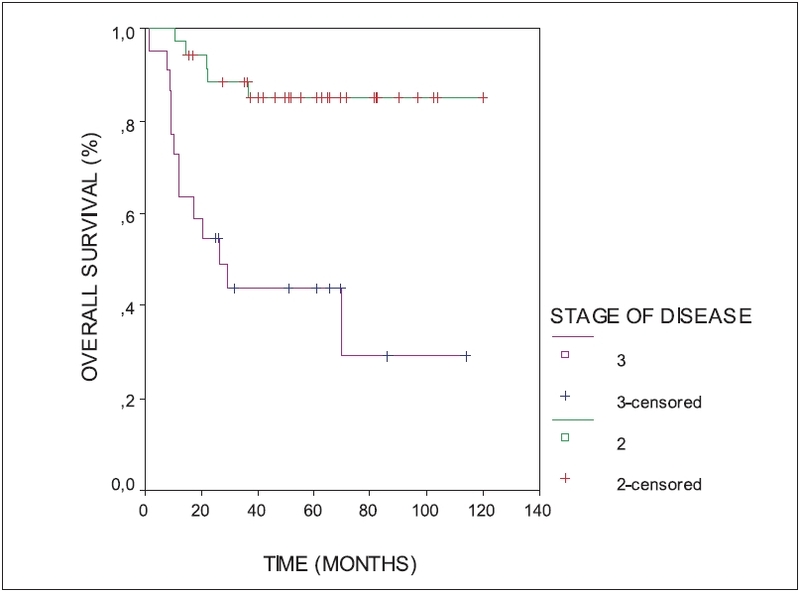 Results: Five-year overall and disease-free survival rates were calculated as 85% and 75% in stage II; 44% and 29% in stage III cases, respectively. Fifty-seven percent of patients were classified in good risk, 9% in intermediate risk and 27% in poor risk groups. Five-year overall survival rates were 97%, 75% and 7% ( P <0.001) and disease-free survival rates were 83%, 34% and 7% ( P <0.001) in good, intermediate and poor risk groups, respectively. Analysis of the prognostic factors revealed that the localization site of the primary tumor ( P < 0.001), the initial stage of disease ( P < 0.001), the initial serum AFP level (p: 0.001), the initial β -HCG level (p: 0.0048), the presence of yolk sac and choriocarcinoma components in tumor (p: 0.003 and p: 0.004), relapse sites of tumor (lung versus other than lung) (p: 0.003), persistent elevation of serum tumor markers ( P <0.001) were significant prognostic factors in univariate analysis. However, in multivariate analysis, only the localization site of tumor (p: 0.049) and the relapse site (p: 0.003) were found statistically significant. Conclusions: This retrospective study revealed that in advanced stage of nonseminomatous germ cell tumors, the outcome is essentially related with the localization site of the tumor and the relapse site. 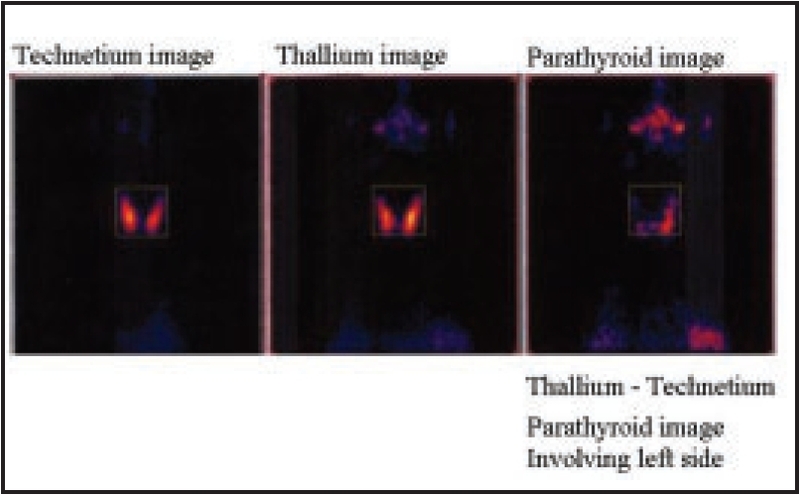 Background: Preoperative detection of parathyroid adenoma is a diagnostic challenge. The sonography and computerized tomography (CT) scan demonstrate high sensitivity but low specificity. The advent of radionuclide scanning technique has enhanced the specificity in this context. Aim: We undertook a study to assess the role of radionuclide scanning in suspected cases of parathyroid adenomas. Materials And Methods: Totally 28 cases were incorporated in the study. The suspicion was raised either due to raised PTH levels or recurrent calcinosis. Most of these patients had estimation of calcium done as a routine or specific investigation. The parathyroid scan was performed using either of the two techniques - Dual isotope subtraction or Sestamibi washout technique. We also used the recent approach of fusion imaging (CT + tomographic nuclear images) in selected cases. Results: There were 16 true positive, 10 true negative, 1 false negative and 1 equivocal scan findings. The findings were compared with sonography, CT Scan and PTH values. The true positive yield in our study was 57%, true negative 35% and the overall sensitivity and specificity was found to be 94% and 100% respectively. Conclusion: We conclude that parathyroid scintigraphy is a reliable and sensitive technique in the preoperative detection of parathyroid adenomas and should be the first choice of imaging modality in suspicion of parathyroid adenoma. The ultimate progress in the cancer diagnosis and therapy has only been possible with the ongoing translational research that is likely to play a very important role in future as well. Hence the importance of such translation from bedside to bench and visa versa cannot be over-emphasized. Accordingly it has become more important to collect tumor samples along with the clinical information in a systematic manner to perform a good basic science research in future. With a population of over a billion and a heavy burden of cancer, India has the 'biggest' potential to establish the 'largest' tumor bank across the globe. Establishing a tumor bank involves money and manpower that may not be feasible across most of the centers in India. 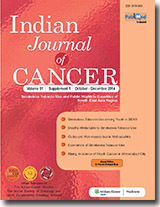 Taking into the considering the model of tumor banking of the two leading institutions of the world (MD Anderson Cancer Center, USA and University Hospital Aintree, Liverpool UK), this article presents the salient tips for a center in India to get started with tumor banking with minimal investment. Furthermore a simplified form of ethical consent is presented for the centers to adapt unanimously. The episodes of nausea and vomiting which follow each cycle of chemotherapy are the most troublesome side effect experienced by cancer patients. 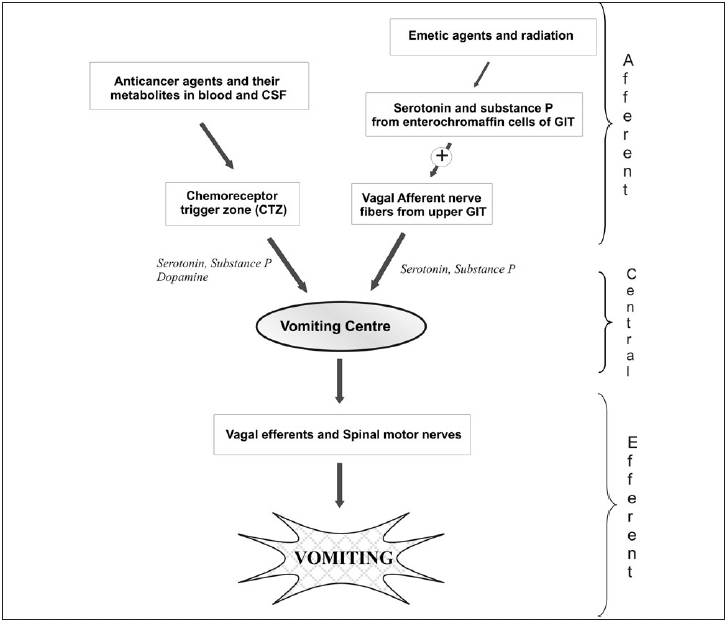 Introduction of ondansetron was a definite therapeutic advance in treating chemotherapy induced nausea and vomiting (CINV) with more effectiveness with corticosteroids. However, the protection remained largely limited to acute phase of CINV with little or no effect over delayed phase. Aprepitant, a drug that antagonizes the effect of substance P on neurokinin type 1 receptor showed promising results in controlling both phases of CINV. This drug is well absorbed orally with a t max of about four hours. The addition of aprepitant to ondansetron and dexamethasone was found to be superior to ondansetron and dexamethasone alone in clinical trials with patients taking high and moderate emetogenic chemotherapy. This drug also showed a good safety profile, but its inhibitory effect on CYP3A4 may result in clinically significant drug interactions needing dose modifications of co-administered drugs. The National Comprehensive Cancer Network guidelines for CINV recommends the use of aprepitant with high and moderately emetogenic anticancer drugs. Results of ongoing clinical trials with aprepitant and other agents of this new class of antiemetics are awaited and may alleviate the sufferings of cancer patients. 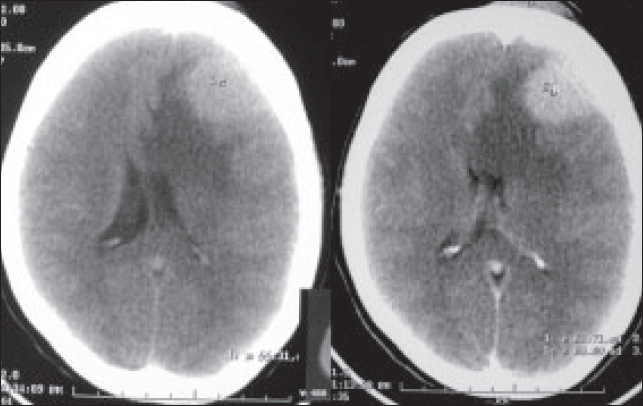 Primary non-Hodgkin's lymphoma of the skull with extra- and intracranial extension without systemic or skeletal manifestation in a nonimmunocompromised patient is extremely rare. These lesions often cause difficulty in diagnosis because they mimic other conditions. We report a case of primary lymphoma involving scalp, skull vault, meninges and invading the brain parenchyma and masquerading clinically and radiologically as a meningioma.